busy chasing my own dreams, not ready to obey. this time I stopped and pondered on your truth. You watched with loving, longing eyes but I couldn’t comprehend it all. how sad I didn’t understand the blood within the cup. I stood my ground stubbornly. thinking ” I can do this on my own”. another sinner lost- and far from home. Crucified, for me he died- Yes, even me! no more need for contemplation. Jesus has made me see! Jesus has set me free! In His name is my victory. Now, I give thanks every day. for His Son who is The Life, The Truth, The Way. in His name I live and pray. 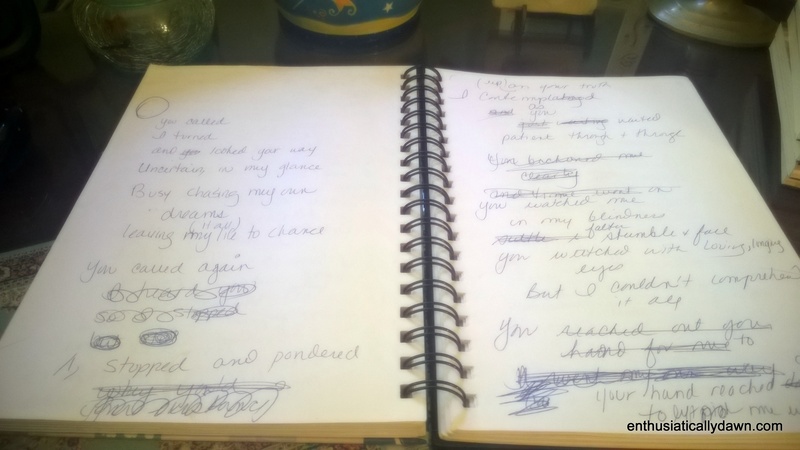 What this poem looked like in process as it came out in my journal. Why do people think that creating is a neat and perfect process? …lol, my process is messy! COme on over and join us for Random Journal Day – all weekend- when a bunch of crazy journal keepers share from their own journal archives! “I stood my ground stubbornly. Aren’t we all – at times – stubborn, ignorant, thinking we can do it all on our own!! Such an awesome poem…thanks for sharing with us for RJD…love how you let your FB followers choose which journal!! I just start pulling them out and reading and reading and trying to find something! Some of my journaling – such as what I used this month – is in its own notebook, typed so it could easily be read. I have also created a scrapbook (nothing fancy, by any means) with newspaper articles, cards, etc. Love RJD! Thanks for sharing yours – and for reading and commenting on mine! I need to read some others’ too!! Your new believer journal looks a little like mine. 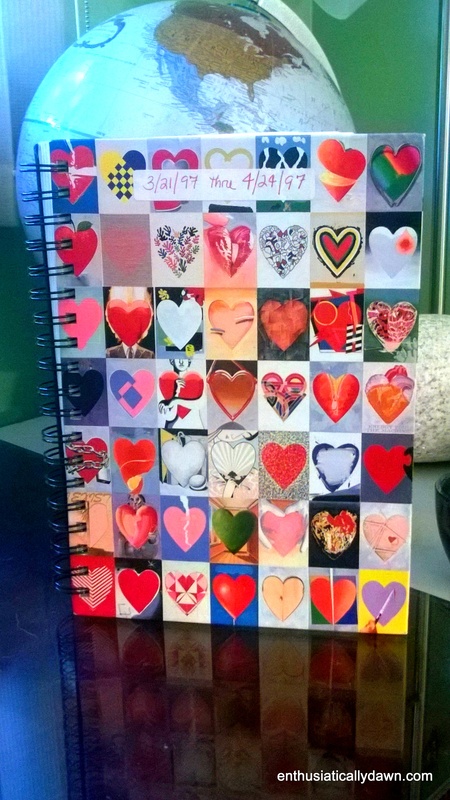 It is a spiral bound mid-size notebook that I put all sorts of “God” stickers on–complete with hearts, crosses, rainbows, and lots of Praise words. I was always buying stickers to the purpose at the Zondervan bookstores–alas, no longer with us, I fear. And yes–I am amazed with what is recorded there. Sermon notes and pondering prose. Not sure if I have the guts to put it out there unedited, though. I tell everyone that I didn’t get a brain til I got saved at 24 years of age. I’m afraid my writing at the time would make that clear. LOL. hahahaha…I totally get that- But fools rush in where Angels fear to tread, Miss Kathy. lol. I love your poetry! It’s true to your heart, Dawn. 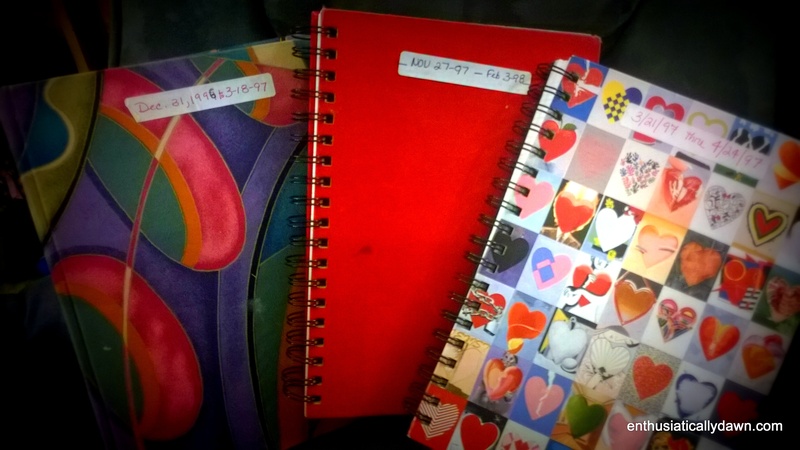 I think I will re-read my journals, very soon–I’ve postponing doing this for awhile now. You’ve inspired me!! Thanks so much…I hope you do!